Beautiful yet relentless would best describe the Ironman 70.3 Aix-en-Provence bike route. It is 90km of constantly changing gradient, varied road surface with extremely technical flat and downhill sections, all of which present a test for which only the triathletes with the strongest legs and the best bike handling skills need apply. After a solid 1.9km swim, Michi entered T1 just over 3 minutes behind strong biker Andi Boecherer. and then put together a cycling masterclass to put himself firmly in contention. A minor recent injury flared up on the run putting paid to a podium but that is sports at the highest level. But now lets take a look at Michi’s SRM power file and I’ll try to unpack exactly what is required to nail the fastest bikesplit in amongst a field of very strong professional triathletes. 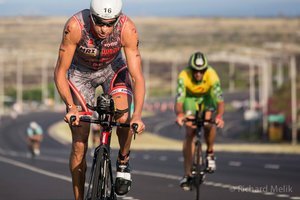 Garth Fox MSc, Sports Science & Human Performance Freaky Friday: Following on from his dominant victory at Ironman Cozumel at the end of 2014, Michi returned from a restful off-season break fresh and ready to get back to business. After a 6-week relatively gentle training block to get him back to early stage fitness we then needed a warm location race to serve as an early season benchmark test. Where better than the inaugural Challenge Dubai half-iron distance race (further evidence of the increased gravitational pull being exerted on the triathlon world by the United Arab Emirates) where the spectacular location, prize purse and likelihood of perfect weather conditions, attracted a Kona-esque field of talent looking to similarly test their early season legs. As it happened, race day had a few surprises for both athletes and the organiser in terms of the prevailing weather conditions and the confusion that reigned following a bike-leg in which 5 of the top 10 athletes were found to have (unintentionally) cut around 4km off the bike course, including the first three across the line. Rather than disqualifications, 4 minute time penalties were served, which left Michi in 11th place overall including the second best bike split of the day, pipped only Martin Jensen back from an 18 month injury related racing hiatus (always beware the super fresh status of athletes returning from injury). Nevertheless a great season opener for Michi and evidence that his condition is heading in the right direction at the right time. 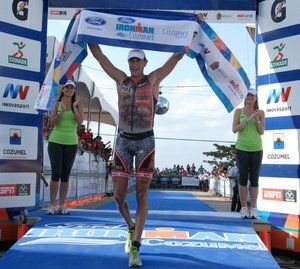 On Sunday 30th November 2014, SRM sponsored triathlete Michi Weiss was crowned Ford Ironman Cozumel Champion for the second year running. His winning time of 08:12:16 set a new course record and contained the best bike split and second best run split of the day. Notable achievements indeed when you consider that this was his twelfth triathlon race in a 12 month racing period that included 4 full Ironman’s and 3 Ironman 70.3’s. In this article I want to describe the year-on-year (YOY) comparison between the Cozumel SRM power files in order to explain what it takes to put over 20 minutes into a class field of pro triathletes, and also look a little more closely into the files to gauge what, if anything, a long, hard year of training and racing has changed about the way that Michi races on the bike and how SRM power file analysis can be used to influence training and get the best out of an athlete. Ironman World Championships - Kailua-Kona, October 11th, 2014 On a day that many were calling the windiest and most difficult bike day in the last 15 years of the Ironman World Championship on the Big Island, Hawaii, SRM sponsored triathlete, Michael Weiss, posted a bike split of 04:33:35. In a stacked field that included all the best Ironman athletes on the planet, that was good enough for the 6th fastest time of the day and that even included a rear wheel puncture while riding at 60km/h just 15km into the ride which took Weiss approximately 5 minutes to repair without race support, damaged his speed/distance sensor and effectively killed his chances of catching the leading group right then and there. Thereafter Michael battled the swirling winds over the infamous lava fields entirely alone making for a long hard day in the saddle. Even so, he still managed an average of 294W (306W normalised power) for the duration and in so doing expended 4770 Kcals.